Santuario B. Il santuario extraurbano del Fondo Iozzino. Sanctuary B. 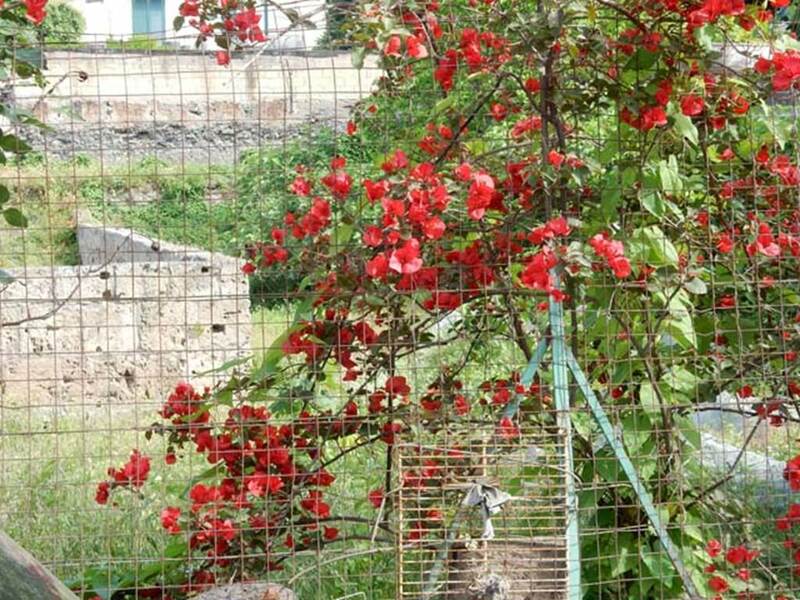 Suburban sanctuary of Fondo Iozzino outside Pompeii. 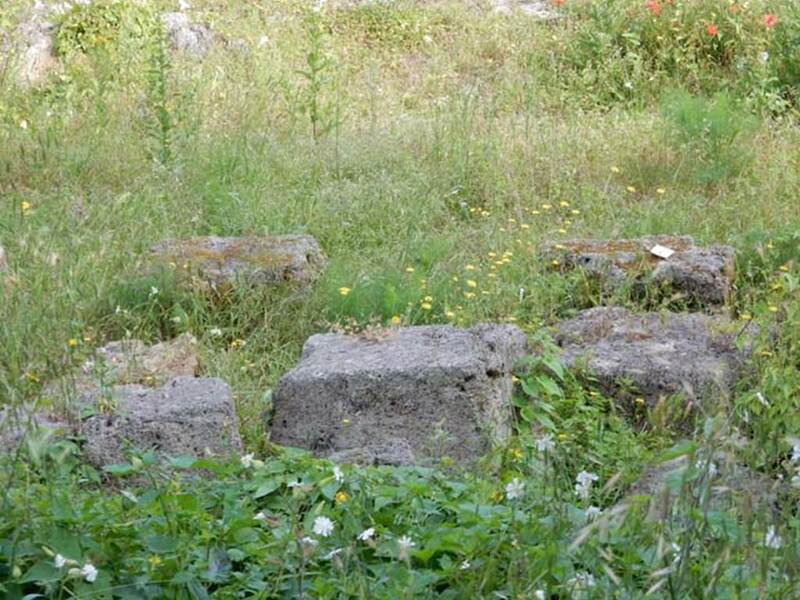 Sanctuary of Zeus Meilichios or Demeter or Ceres or Hecate - Artemis. Excavated 1960, 1992, 2014 onwards. Restoration 1992. 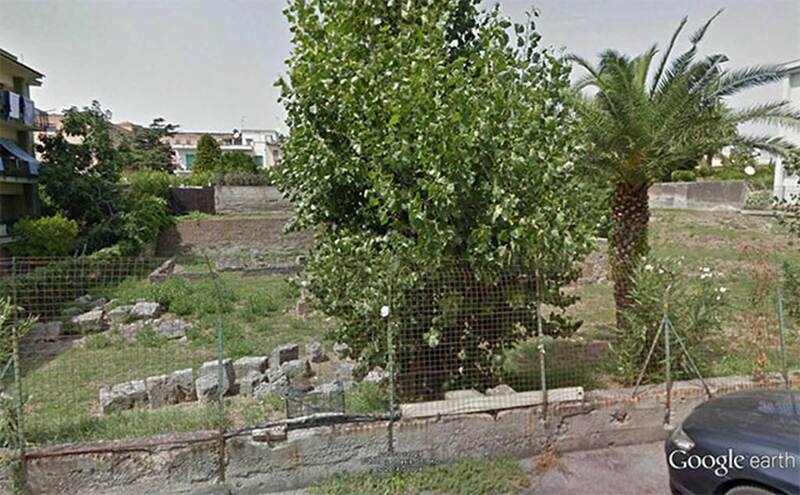 The sanctuary is a few hundred metres south of the Porta Nocera of Pompeii. There was a partial excavation of the building in 1960. 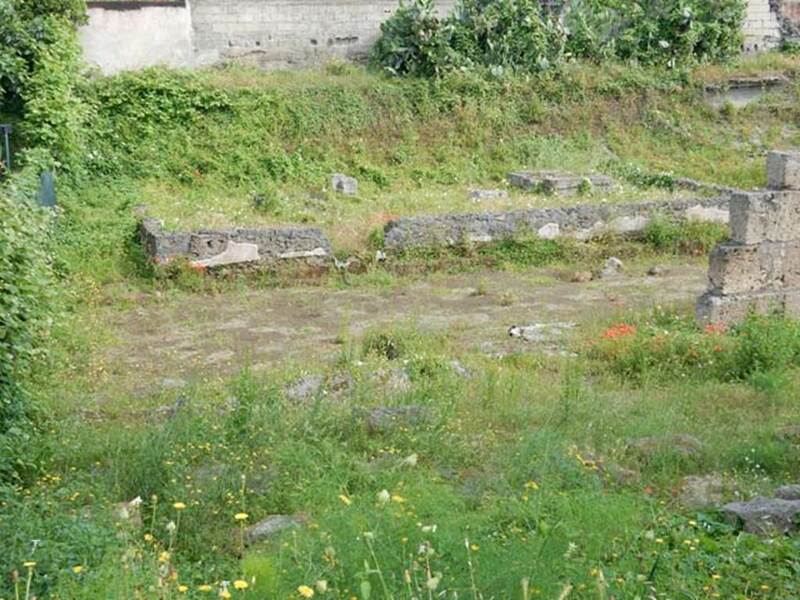 A further excavation was conducted in the summer of 1992 in the former Fondo Iozzino, in government land in modern urban centre of Pompeii. 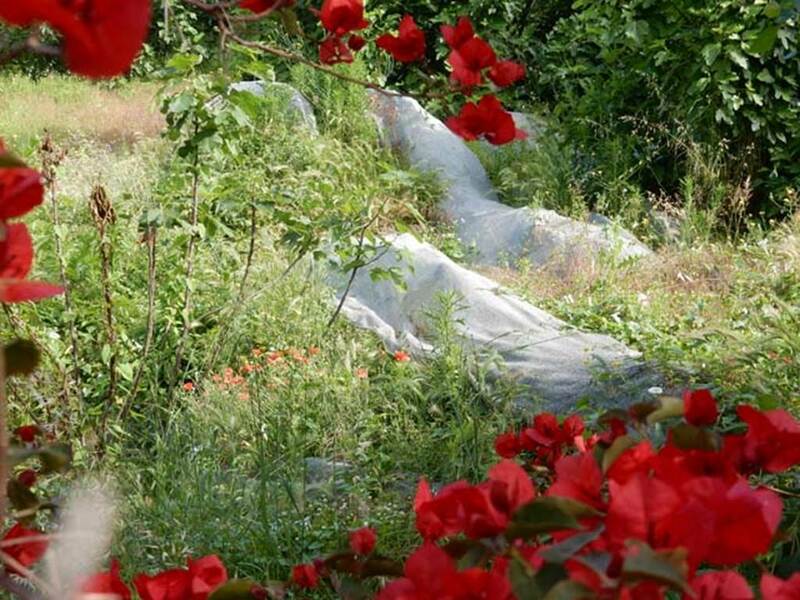 The Sanctuary, located in the heart of the modern city in what was once an Iozzino owned quarry for the extraction of lapilli, has since 2014 borne witness to thorough and continuous research. According to an information card in the SAP exhibition in 2017, it was a place of worship as early as the 7th century BC. 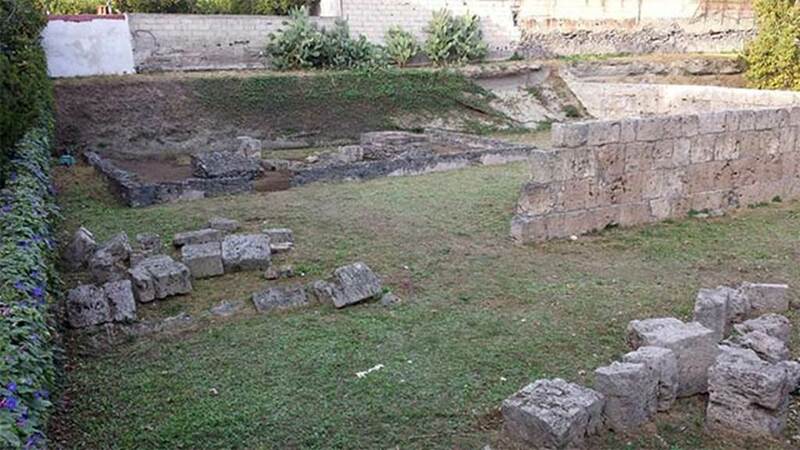 It was monumentalized with a limestone precinct in the 3rd century BC. In the space defined by this structure, an additional tufa precinct was identified, in which were discovered three female clay sculptures dating to the mid to late 2nd century BC. Santuario extraurbano del Fondo Iozzino. May 2018. Information card in exhibition. 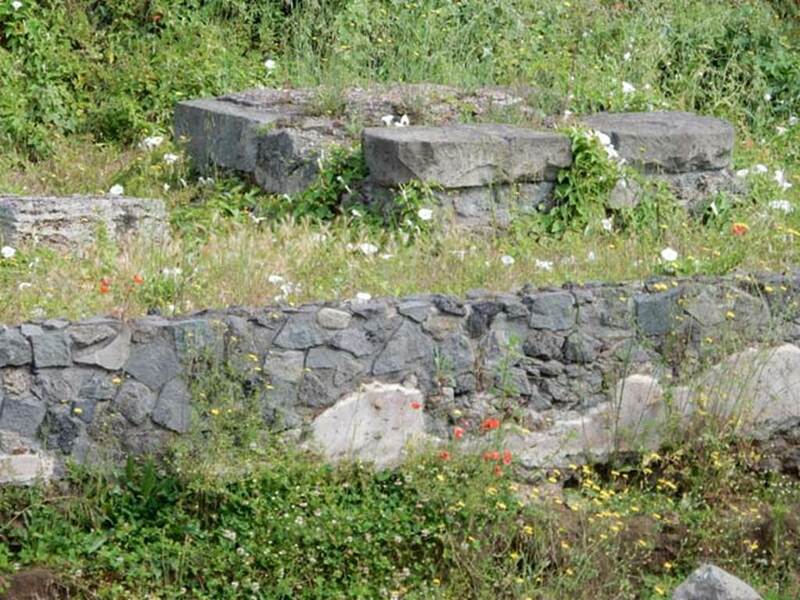 The sacred area consisted of a double fence, enclosing small niches where were discovered three female clay sculptures, one identified as Aphrodite, another maybe as Demeter. The Hellenistic phases were preceded by a significant occupation in the archaic and classical times, documented by the huge presence of votive materials, consisting of cups, jugs, metal tools and weapons. Of particular interest is the group of vessels with scratched inscriptions with the name of the devotees in Etruscan language. Bielfeldt R., 2007. 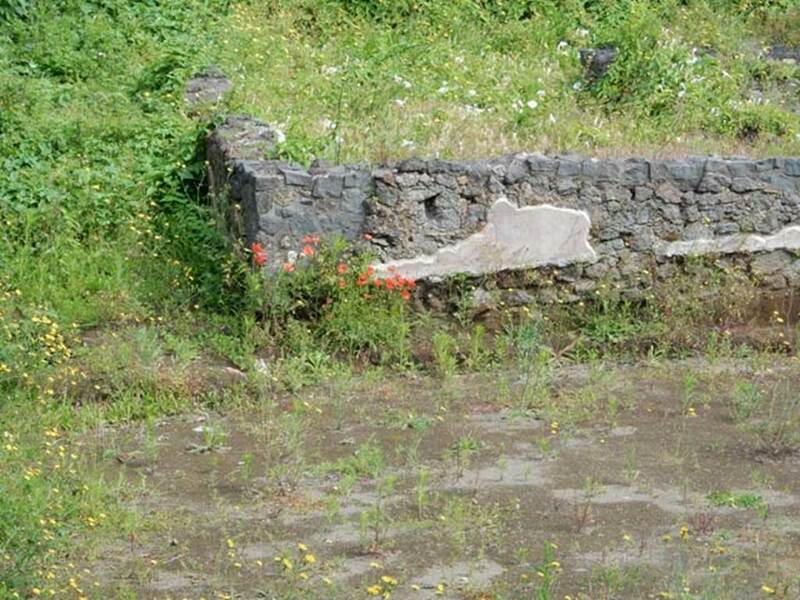 Der Liber-Tempel in Pompeji in Sant’Abbondio. Oskisches Vorstadtheiligtum und kaiserzeitliches Kultlokal, dans MDAI-Römische Abteilung, 113, p. 365, Abb. 24. Casadio G., Johnston P. A. (Eds. ), Mystic Cults in Magna Graecia, p. 249, note 18. Coarelli F., 2002. Pompeii. New York: Riverside Book Co, p. 100-1, p. 90. Cooley, A. and M.G.L., 2004. Pompeii: A Sourcebook. London: Routledge, A8, p. 9. D’Ambrosio A., Borriello M. 1990. Le Terrecotte Figurate Di Pompei. Roma: L’Erma di Bretschneider, p. 14; 18, p. 24, tav. 5; 20, p. 26, tav. 6. D’Ambrosio A., Attività della Soprintendenza in Rivista di Studi Pompeiana VI, 1993, p. 219-221, figs 1-5. De Caro in Dobbins, J. J. and Foss, P. W., 2008. The World of Pompeii. Oxford: Routledge, p. 80. Pappalardo, U., 2001. La Descrizione di Pompei per Giuseppe Fiorelli (1875). Napoli: Massa Editore, p. 31 . Santuario extraurbano del Fondo Iozzino. 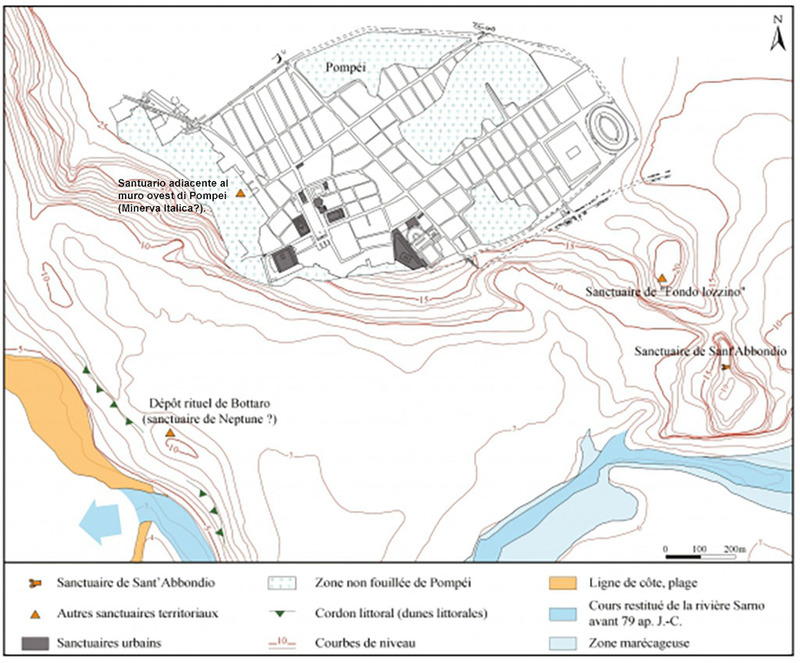 Map with location of temple = B.
Pompeii Stabian Gate. March 2009. 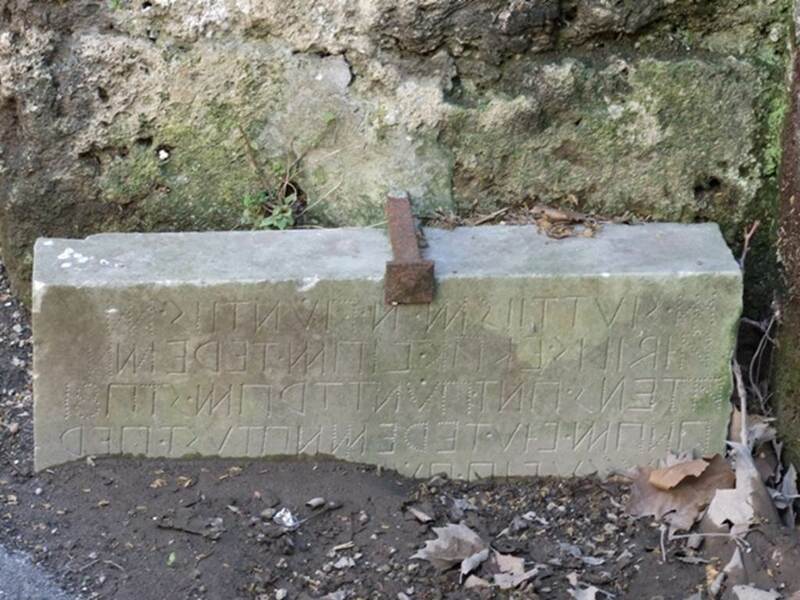 Oscan inscription on west side. Only four of the eleven lines were visible in March 2009, with seven buried. 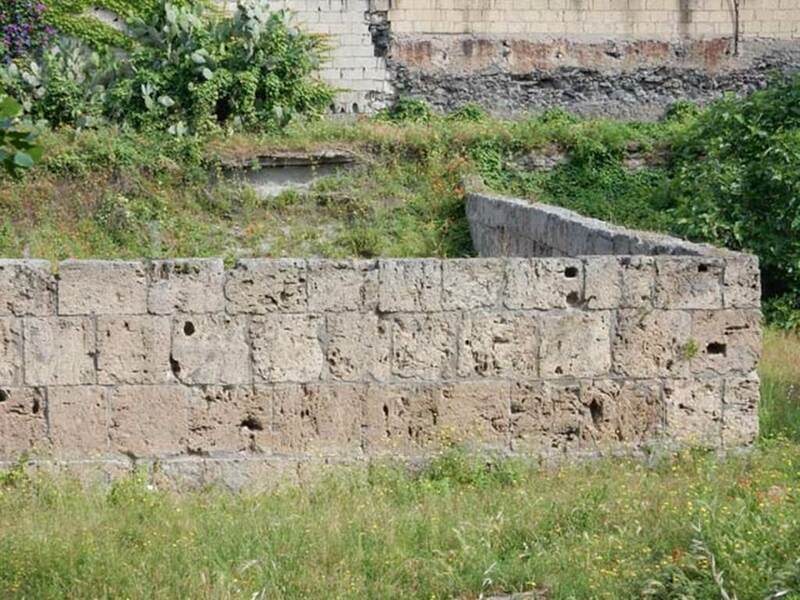 Pompeii Porta Stabia. 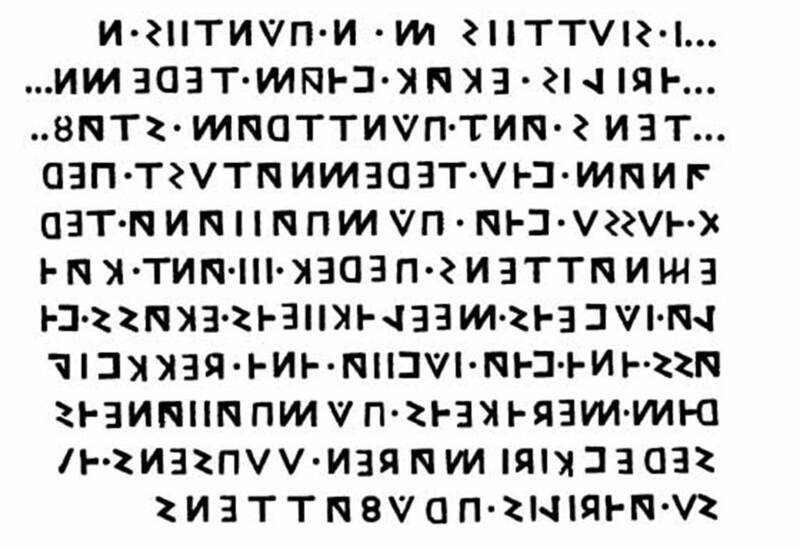 Reproduction of the inscription by Fiorelli. [Descrizione 1875 p. 29]. “M. Suttius, son of M., and Numerius Pontius, son of M., aediles, marked out this road as far as the lower Stabian road. The road is marked out over 100 feet. 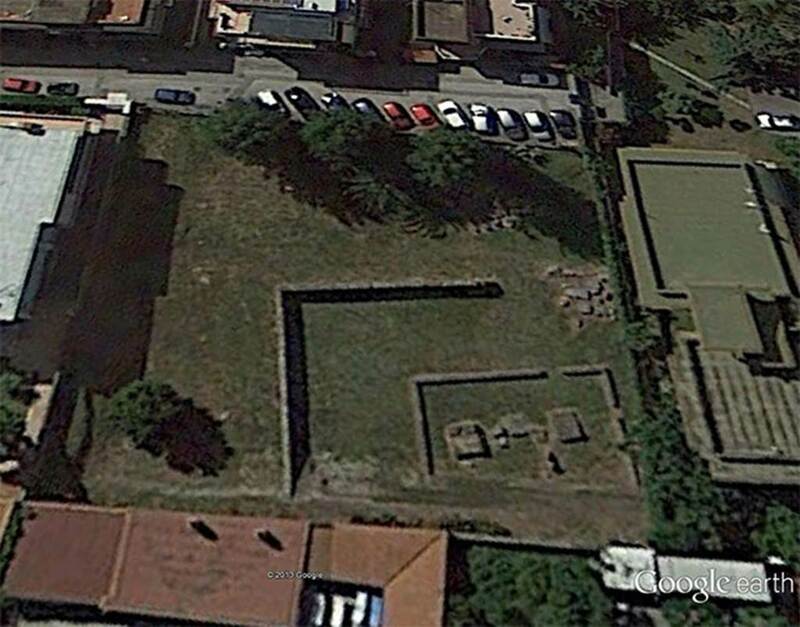 The same magistrates marked out the Pompeian road over 30 feet as far as the Temple of Jupiter Meilichios. They officially established from scratch these roads and the road of Jupiter and the (?) road by order of the Pompeian chief magistrate. The same aediles approved the work”. The first sentence may end ‘Stabian bridge’ rather than ‘lower Stabian road’. The identity of the Temple of Jupiter Meilichios mentioned here is disputed. 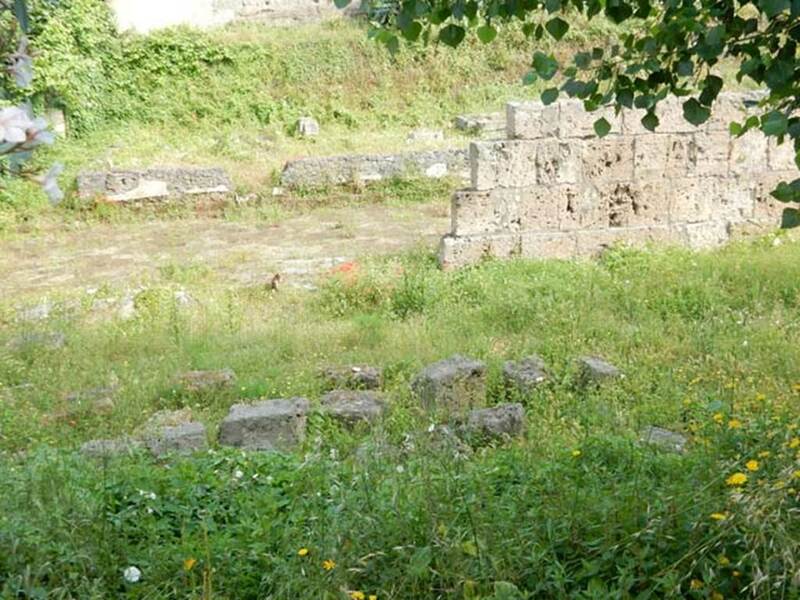 Traditionally it is identified as the small temple at VII.4.25 to the north of the theatres. 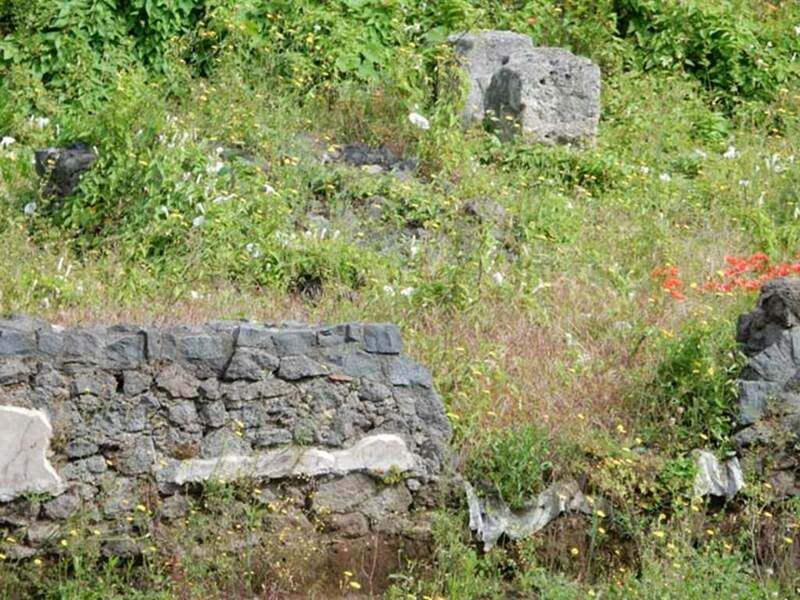 It may alternatively be a small shrine in a sanctuary just outside Pompeii, in the Fondo Iozzino. See Cooley, A. and M.G.L., 2004. Pompeii: A Sourcebook. London: Routledge, A8, p. 9. See Guzzo P., in Dobbins, J. J. and Foss, P. W., 2008. The World of Pompeii. Oxford: Routledge, p. 185. 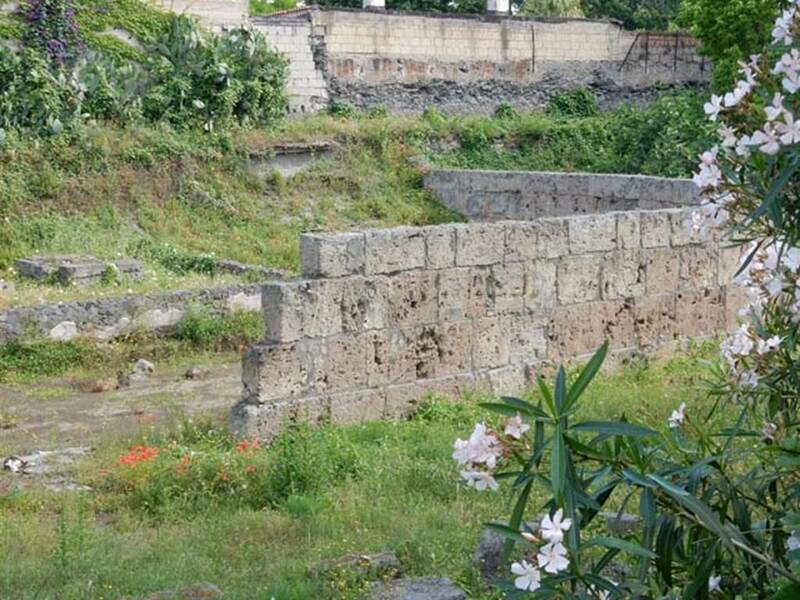 According to Coarelli, the inscription says that the street extended from the Stabian Gate by ten pertiche or 10 rods or and thus probably as far as the Sarno, which at this point ran close to the southern walls of Pompeii. 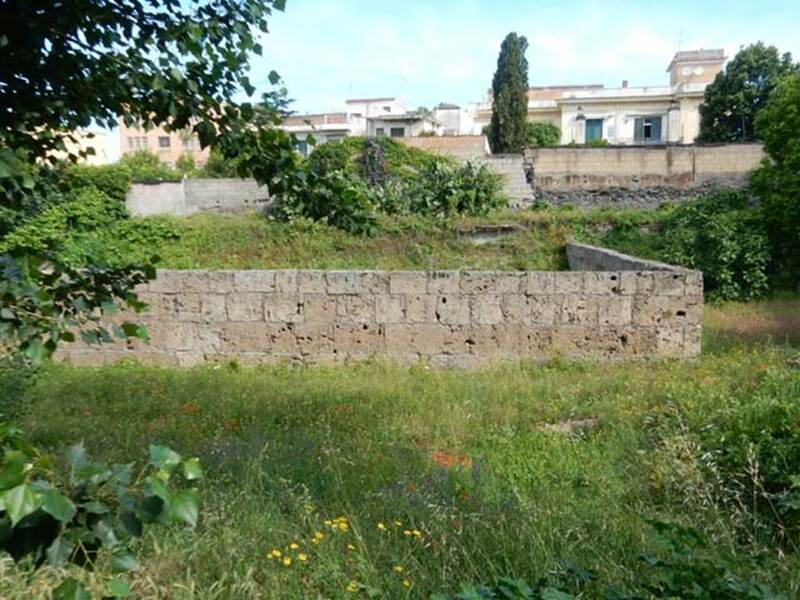 The inscription adds that the Via Pompeiana was limited by the length of 3 pertiche as far as the Cella of Jupiter Meilichios. 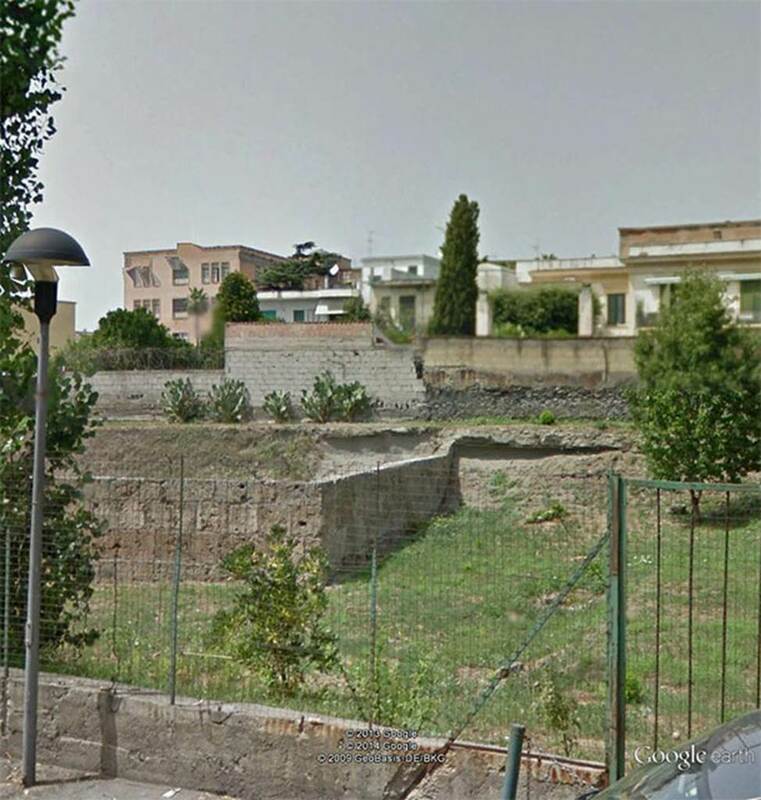 This suggested the latter road separated from the road to Stabia, just before the Sarno, turning to the east. This would coincide perfectly with the location of Fondo Iozzino which was at that exact distance to the east of the road to Stabia. See Coarelli F., 2002. Pompeii. New York: Riverside Book Co, p. 100-1. 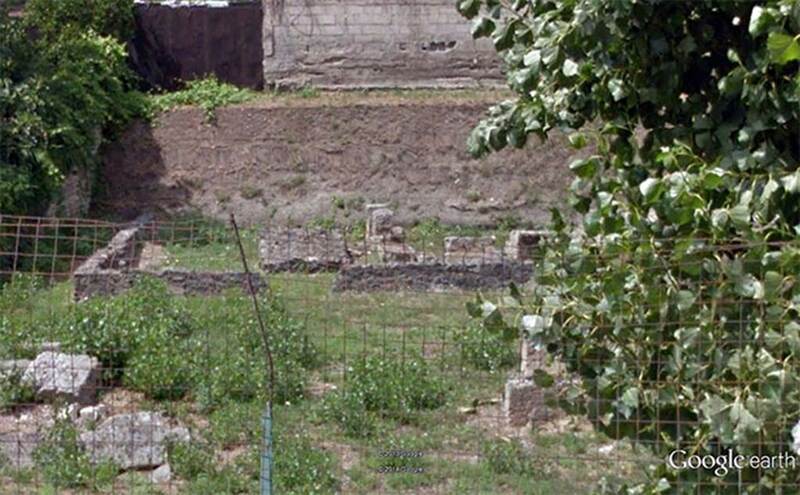 According to de Caro, he identifies as the Sanctuary of Zeus Meilichios this sacral complex on the same ancient road to Stabiae [as the one in Pompeii], but outside the city, on the Fondo Iozzino. 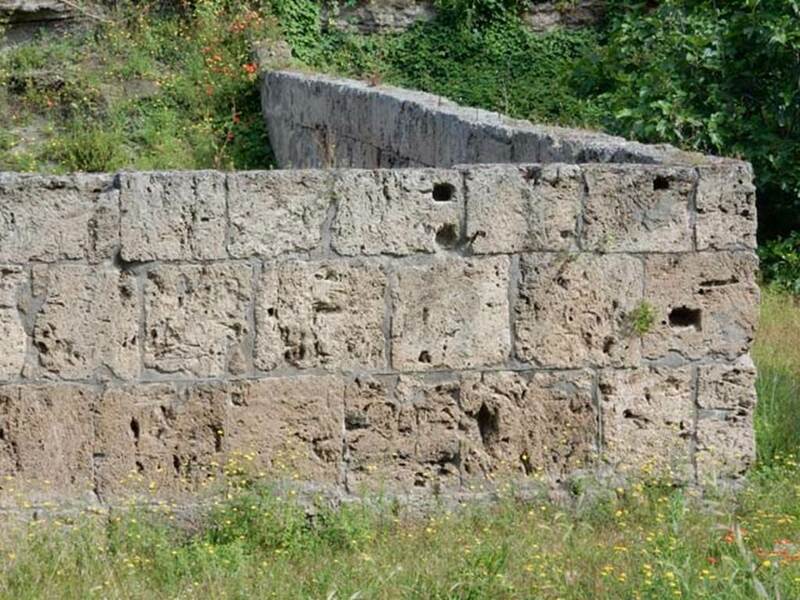 Here, a large retaining wall of opus quadratum in Sarno limestone encloses some sacella. Fragments of bucchero, Campanian red-figure pottery and some terracotta statues attest the long life of the sanctuary and the importance of its cults, some certainly chthonic (a clay statue has been identified as Hekate). 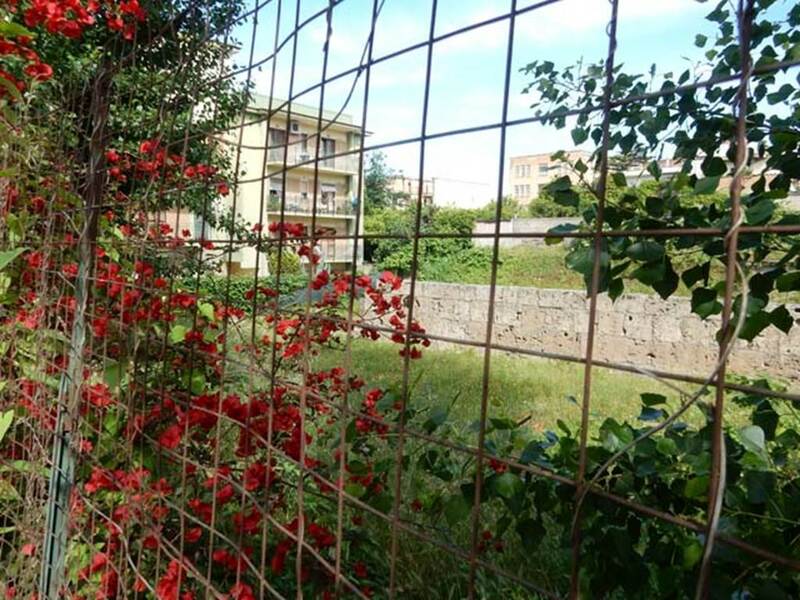 We do not know whether this extra-urban sanctuary on the Fondo Iozzino housed the public cult of Ceres, which the Roman colony seems to have inherited together with that of a Venus Physica from the Samnite city. 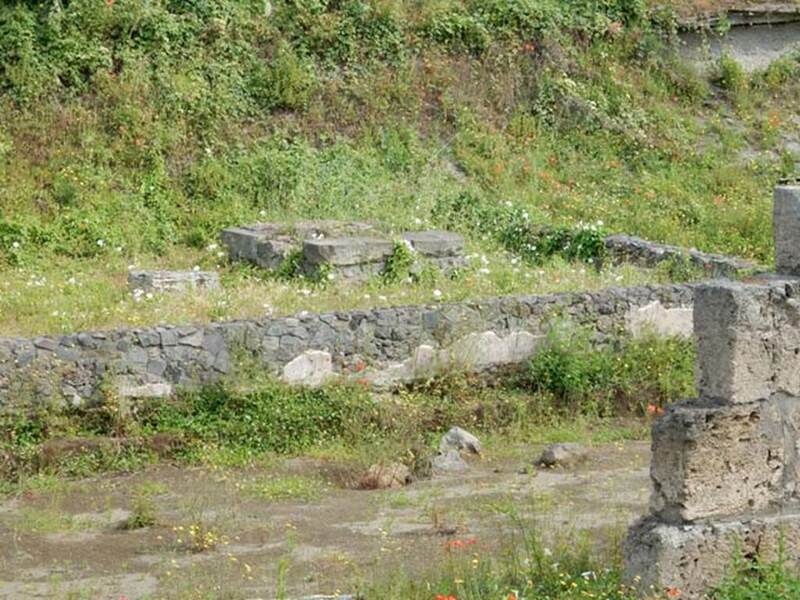 These temples have definitely not been identified in the city [of Pompeii], and it is not impossible that the Samnite Kerres/Ceres here had the features of the Greek Malophoros. See De Caro in Dobbins, J. J. and Foss, P. W., 2008. The World of Pompeii. Oxford: Routledge, p. 80. According to Small, several extra-mural sanctuaries have been identified, all of which go back to the pre-Roman period (Figure 28.1 A–C). 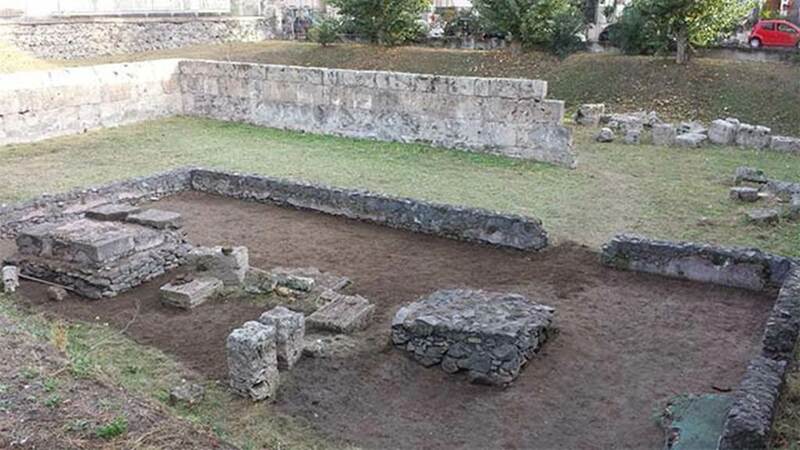 The best known is a small temple of Dionysus situated on the top of a low hill at S. Abbondio near what was then the mouth of the Sarno river. There was also a sanctuary at Bottaro in the so-called Borgo Marinaro, probably dedicated to Neptune. 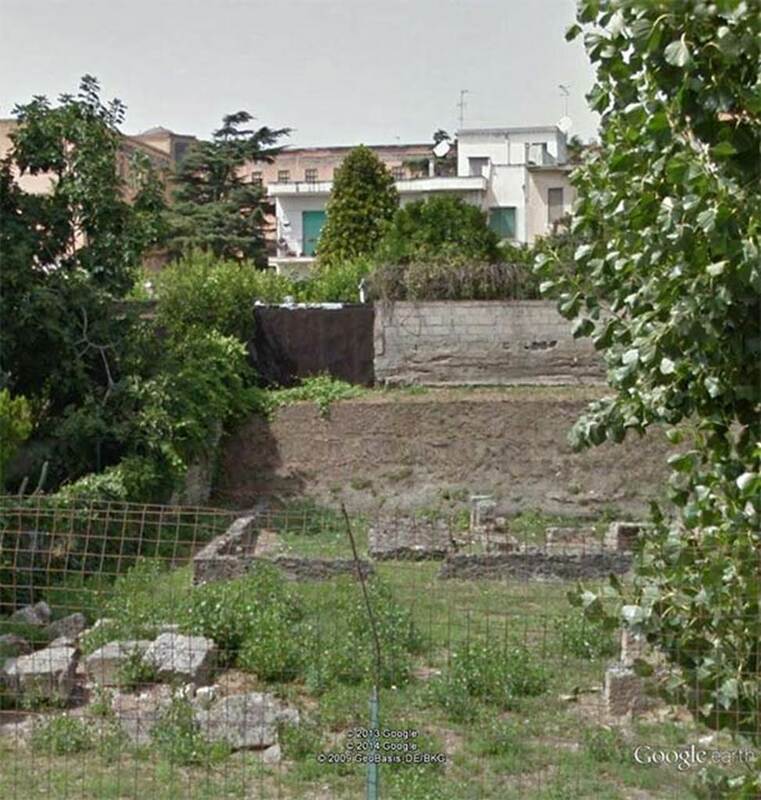 The third was in the Contrada Iozzino to the south of the city, beside the road that leads from the Porta di Stabia, which is perhaps to be identified with the Temple of Jupiter Meilichios referred to in the Oscan inscription. Its situation, surrounded by graves, would be appropriate for the cult of this chthonic god. Santuario extraurbano del Fondo Iozzino. 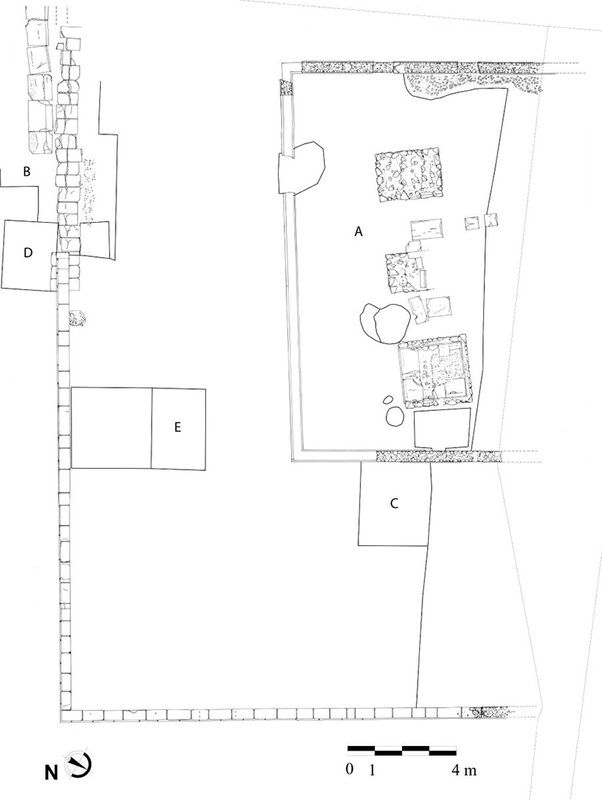 Plan of sanctuary. North is at the top. 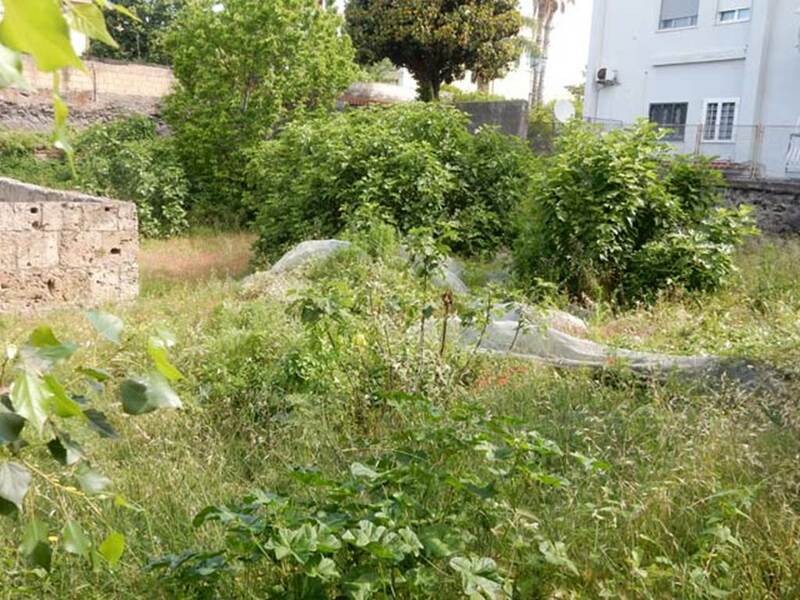 Two concentric quadrangular enclosures were found. 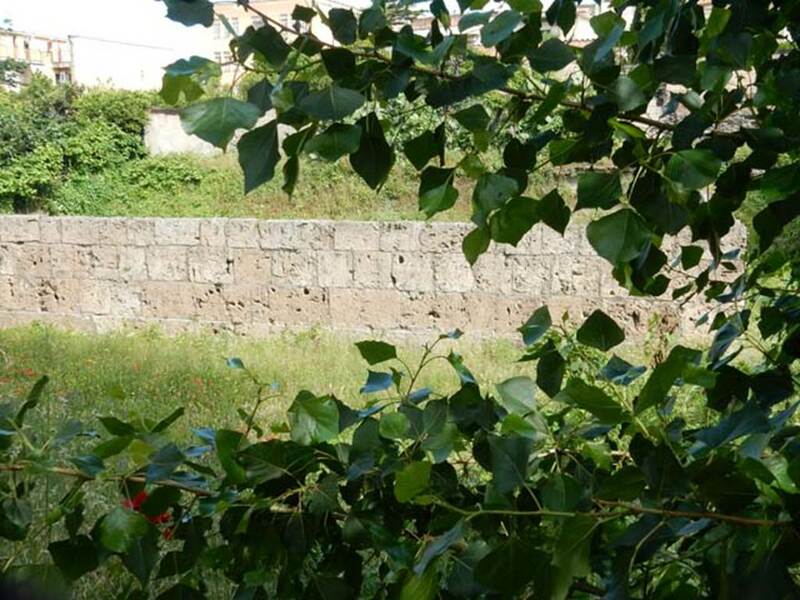 The outer wall was thick and built in limestone. 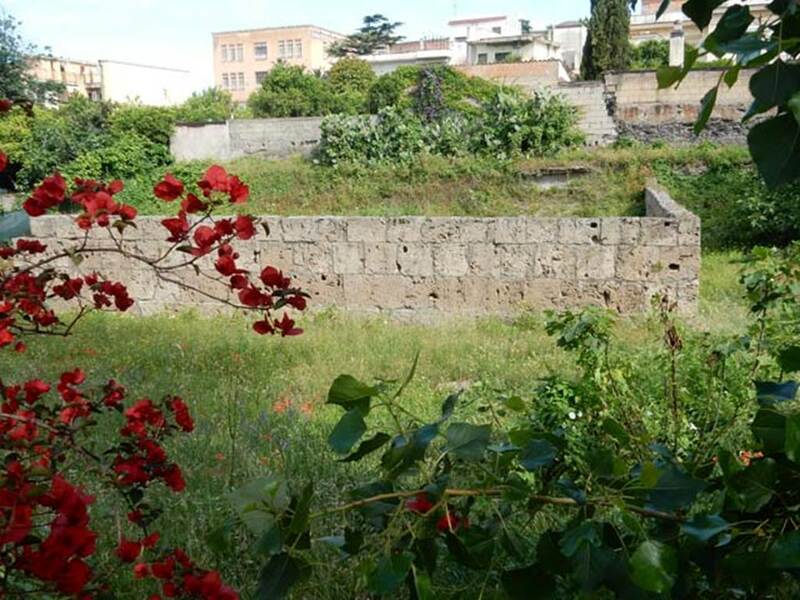 The inner wall, rebuilt in the second century BC, was in opus incertum in tufa. The inner wall surrounded three small temples. This kind of structure revealed the secret nature of the cult, with ceremonies restricted to initiates. See Coarelli F., 2002. 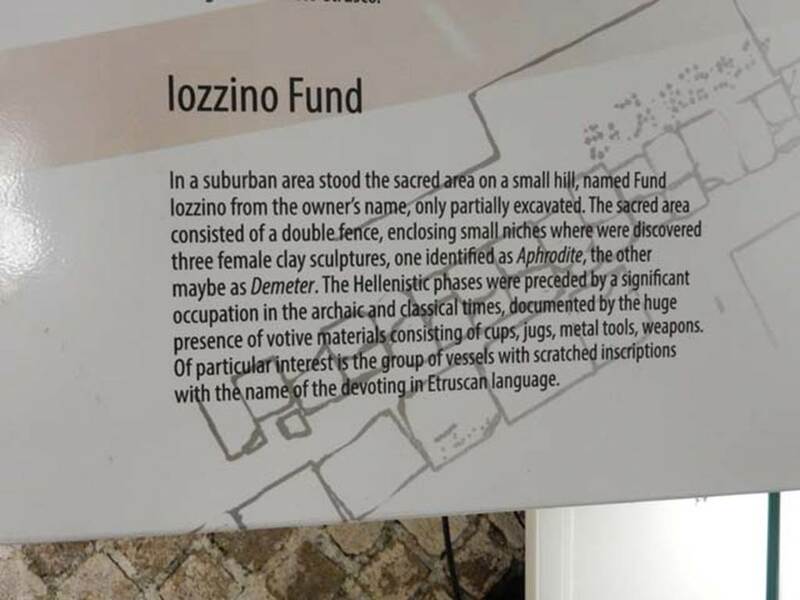 Pompeii: English Language edition, p. 100-1. See Casadio G., Johnston P. A. (Eds. ), Mystic Cults in Magna Graecia, p. 249, note 18. The plan shows the find locations of two of the statues. One is outside the north-west corner of the central temple and the other outside the north-east corner of the eastern temple. The find locations of two of the terracotta objects are also shown. Santuario extraurbano del Fondo Iozzino. September 2018 plan of sanctuary. Santuario extraurbano del Fondo Iozzino. August 2012. Looking north. The inner and outer walls and the three temples can be seen. Santuario extraurbano del Fondo Iozzino. August 2012. Looking south. According to Coarelli, the three temples were open towards the north and had various altars between them. This indicated a complex cult, dedicated to several “underworld” divinities. 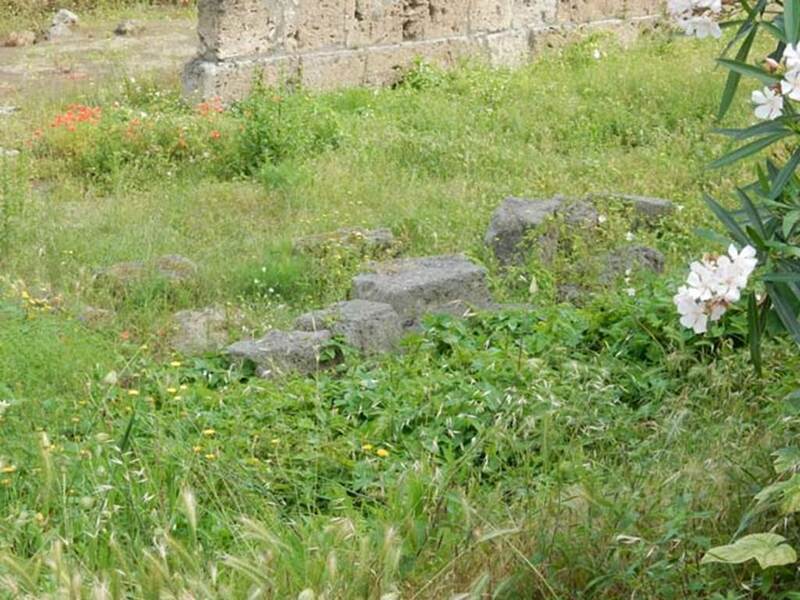 Two female statues, dating from the end of the second century BC, were discovered, one of full size and one of half size. 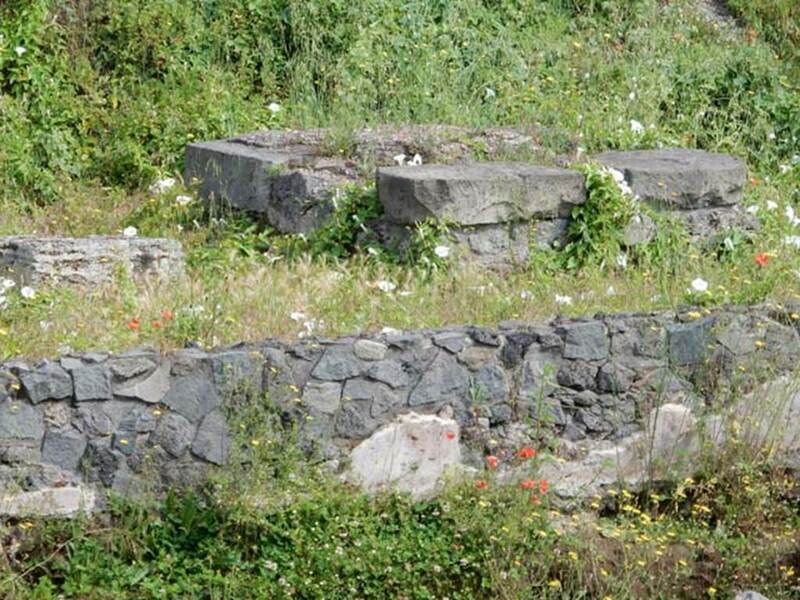 This must have been a sanctuary to Hecate, Jupiter Meilichios and Ceres. 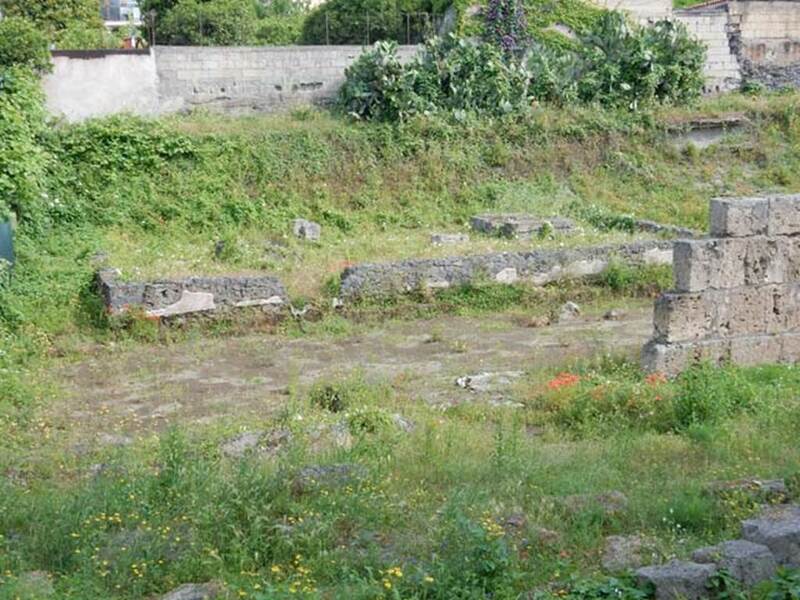 It was located at an important intersection outside Pompeii, near the port and the mouth of the Sarno. Santuario extraurbano del Fondo Iozzino. August 2012. Looking north across the sanctuary. Santuario extraurbano del Fondo Iozzino. August 2012. The east side of the sanctuary. The thick outer wall built in limestone can be seen. 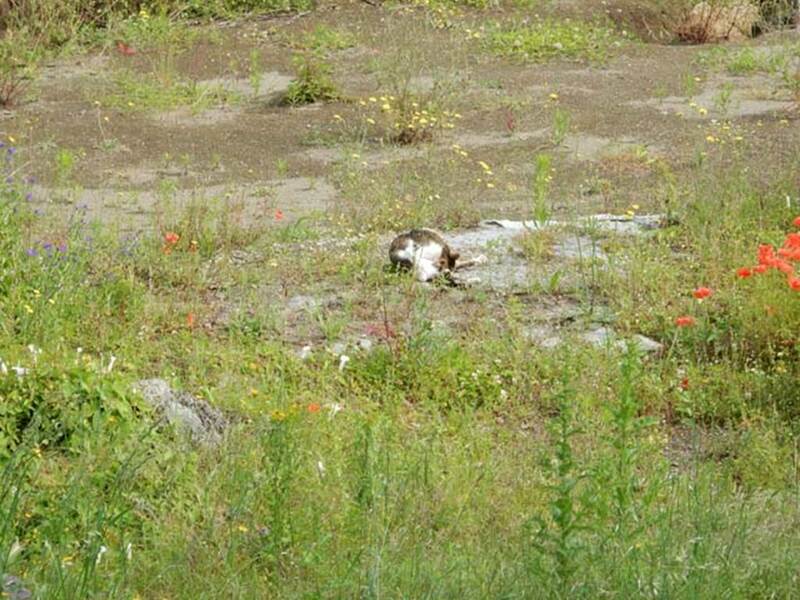 Photo courtesy of Google Earth. Santuario extraurbano del Fondo Iozzino. August 2012. The west side of the sanctuary. The inner wall and three small temples can be seen. 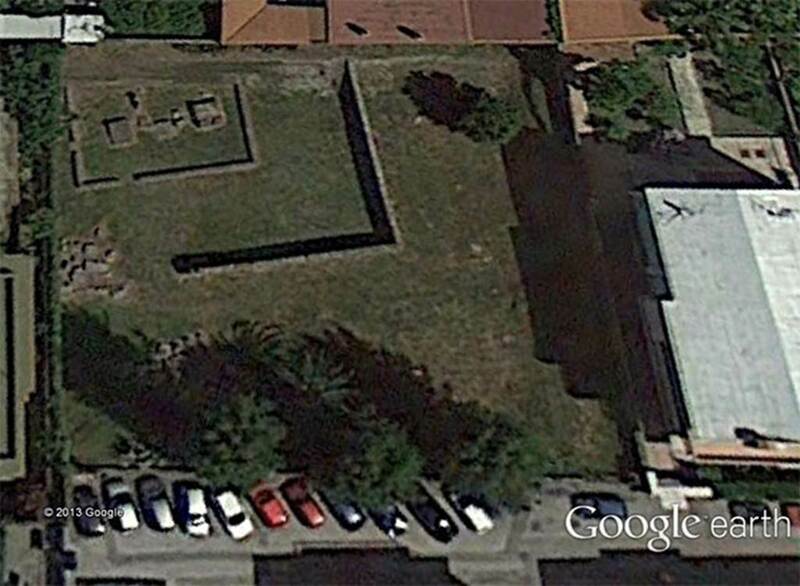 Photo courtesy of Google Earth. Santuario extraurbano del Fondo Iozzino. August 2012. Three small temples behind the inner wall. Santuario extraurbano del Fondo Iozzino. May 2018. Limestone block outer wall with opus incertum inner wall behind. Santuario extraurbano del Fondo Iozzino. May 2018. Blocks on ground. Santuario extraurbano del Fondo Iozzino. May 2018. 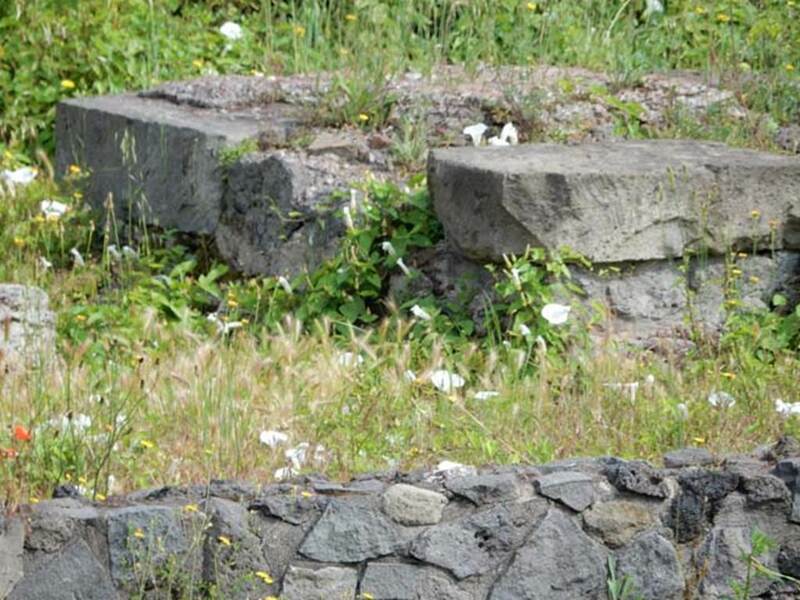 Blocks on ground outside south wall. Santuario extraurbano del Fondo Iozzino. May 2018. Sarno limestone outer wall, four blocks high. Santuario extraurbano del Fondo Iozzino. May 2018. Sarno limestone outer wall, south-east corner. Santuario extraurbano del Fondo Iozzino. May 2018. Sarno limestone outer wall, detail of south-east corner. This was found in a state of collapse in 1960 and rebuilt before the excavations began. Photo courtesy of Buzz Ferebee. Santuario extraurbano del Fondo Iozzino. May 2018. Outer wall south and east sides. Santuario extraurbano del Fondo Iozzino. May 2018. Base of modern property behind the north-east corner of the temple. Santuario extraurbano del Fondo Iozzino. May 2018. South outer wall. Santuario extraurbano del Fondo Iozzino. May 2018. South wall. Santuario extraurbano del Fondo Iozzino. May 2018. South-east corner of outer wall. Santuario extraurbano del Fondo Iozzino. May 2018. South-east corner of site. Santuario extraurbano del Fondo Iozzino. May 2018. Covered items in south-east corner of site. Santuario extraurbano del Fondo Iozzino. May 2018. Inner area looking north. Santuario extraurbano del Fondo Iozzino. 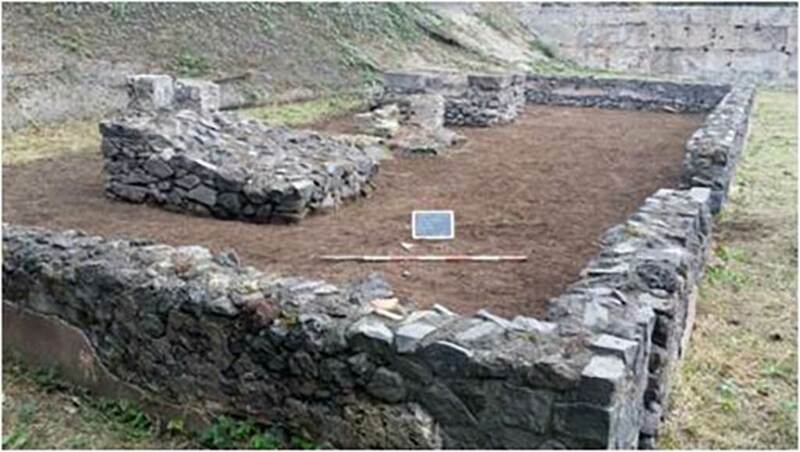 2014, site with new excavations in progress. It consists of an outer wall of large blocks of Sarno limestone (Opus quadratum). This surrounds a smaller and later wall, in Opus incertum, enclosing small structures, also in Opus incertum, the podiums of the two shrines as well as remains of walls of uncertain interpretation. 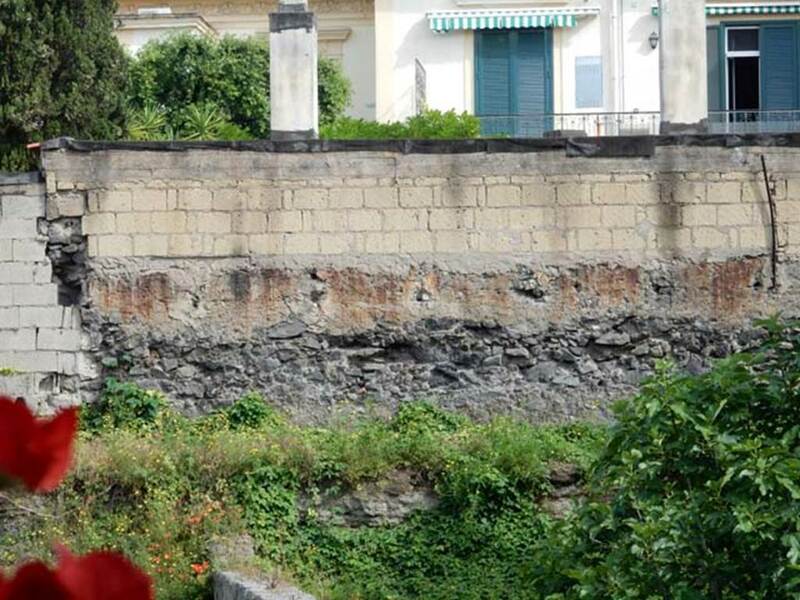 The external enclosure of blocks of limestone, found in collapse, was rebuilt and the structure in Opus incertum was restored before starting excavation in 1960. Santuario extraurbano del Fondo Iozzino. 2014, with new excavations in progress. Interior of temple. Santuario extraurbano del Fondo Iozzino. 2014. New excavations in progress. Santuario extraurbano del Fondo Iozzino. 2014. 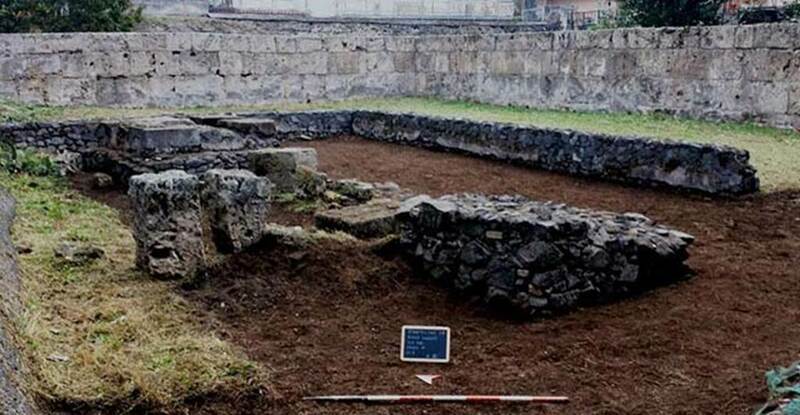 New excavations in progress in inner enclosure. Santuario extraurbano del Fondo Iozzino. May 2018. Inner wall and temple podiums. Santuario extraurbano del Fondo Iozzino. May 2018. Opus incertum inner wall south-west corner. Santuario extraurbano del Fondo Iozzino. May 2018. Inner wall and east temple podium. Santuario extraurbano del Fondo Iozzino. May 2018. East temple podium. Santuario extraurbano del Fondo Iozzino. May 2018. Western temple podium. Santuario extraurbano del Fondo Iozzino. May 2018. Eastern temple podium. Santuario extraurbano del Fondo Iozzino. May 2018. East end of temple. Santuario extraurbano del Fondo Iozzino. May 2018. Cat looking after the temple.